I don't even know what to call my collection of words and numbers. Bistro Ware? English Ironstone? French Enamelware? 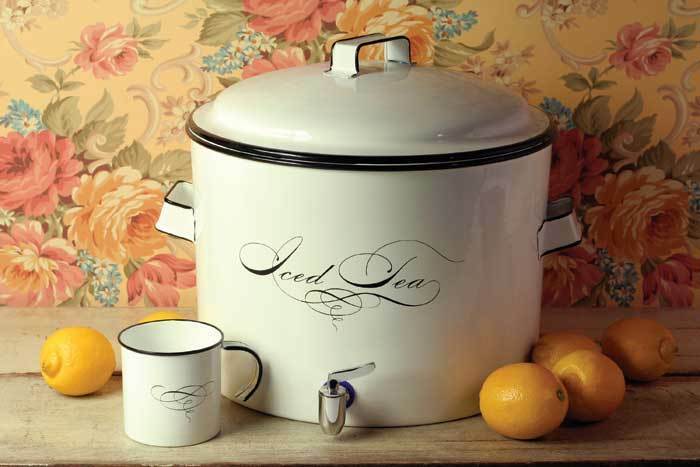 Whatever, I love the simplicity of the bold lettering on the white ironstone or enamel. Most of my collection is in our wine country kitchen. It just seems to fit there. Although, the two porcelain slabs in our kitchen at home work well there too. I like how it mixes with the French confit pot, giving the kitchen a French Country look. The ironstone slabs are hard to find, and mine are reproductions. Joni at Cote de Texas recommends on her website these ironstone slabs found here. Here's where I found some of my "words:"
Everything else was found at either flea markets, antique stores, TJ Maxx, Marshall's or Ross! In the meantime, here is what I'm loving right now! Available at Victorian Trading Company. I think it will be a nice addition to my collection, don't you? On Friday, I'm linking up to Artie at Color Outside the Lines for Vignette Friday. I'm also linking up to Cindy at My Romantic Home for Show and Tell Friday. Be sure to check out these parties for inspiration! Thanks for such a fabulous post!! I don't know what to call it either, but I LOVE it. I never thought of a collection of this kind. But, so unique! Still having problems with "Service Unavailable", so this may be a duplicate comment. Just wanted to say I want a kitchen like yours, and really like the word and number pieces. What a fabulous collection! Love the 'Pure Butter' slab. What a fun post. And a super collection. You have a wonderful way of putting things together. I LOVE the iced tea canister. Just may have to go over and look at that too. I always feel like I am in for a treat when I visit! Such a cute blog. Love those coffee cups. Another collection. You have so many, all great ones. The "words" one is unique and wonderful. Mine would have to say things like "chipped", "glued together", "dropped" etc. Seems like lately everything I own is "distressed" in some way! Great collection Delores! Just love your kitchen! I love things with words on them too! I can totally relate to Heidi's funny comment, and would like to add that I probably like things with words on them, cuz lately I find myself having trouble remembering words! lol! Such a beautiful blog and unique collection! Love it. I love your collection, Delores. I'm also into words and recently numbers. Seems to go well with our new kitchen. You've got a great collection and I think you need the ice tea jar! I adore your honey pot! I need to find one of those. Have a great week. Great collection1 Thanks for the info! I may have to "save up" for one of those slabs! Love this post!!! !Every bit of it! Totally suits you. Helps you remember what everything is for too. I like that in a kitchen. Ha. I am also addicted to things with words - maybe because we are talkers??? :) My quotes, pillows, and dishes are sprinkled throughout the house but I am coveting your collection here. Great fun. Love your collection of "words". The pure butter slab is one of my favorites! Delores, You have a fantastic collection. I looked for an antique butter slab for years with no luck. I have the reproduction slab and it is one of my favorite things. I see you and I have several of the same "word" pieces. Marvelous collection. I especially like the slabs. Difficult to find "chocolate"...my weakness. Enjoyed seeing your fun and wonderful collection. My daughter went off for studies in Florance a few years back. It was absolutely wonderful for her (and for me, who visited often! )Hope your son has a great Semester there! i love the look of it all. i have used many pieces that i picked up at clignancourt flea market/paris. Very clever post! I always love visiting your blog. So beautiful that I am at a loss for "words". I especially like the Sprinkle container and the Bistro de Paris coffee cup. I am so in love with your beautiful collection. I have wanted the slabs forever but haven't found any. Thanks for the tips on where to get some of the others. You've made me realize how much I like "word" pottery as well. I don't have nearly the collection as you, but I've got a few peices poking about. By the way, both of your kitchens are lovely. Oooo, not about this post, but, that Charles Faudre book - on your sidebar, here, looks really, really good! The funny thing about words and numbers is, they help my boys sooooo much. Label it and there right there with me, instead of "lost in space" somewhere. It's like magic.